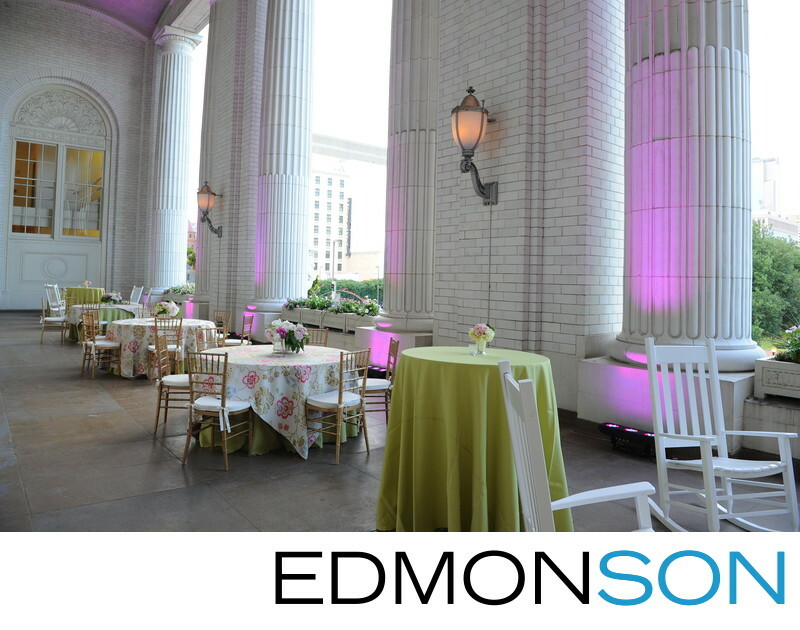 The historic Union Station in downtown Dallas is one of the premier wedding ceremony & reception venues in the metroplex. Featuring the delicious food offered by Wolfgang Puck catering, the landmark building was completed in 1916 and restored in 2008. Wedding coordinators DFW Events created an inviting scene for guests during this daytime reception on the Loggia of this Beaux-Arts Classic masterpiece. With stately columns rising and framed with incredible reliefs and just outside the Grand Hall with its gorgeous chandeliers, the outdoor space is the perfect place for your guests to socialize and celebrate. See what the interior of the reception looked like by checking out one of our other favorite wedding venue pictures. Union Station still operates as a Terminal for the DARL Light Rail, Trinity Railway Express, and Amtrack, but it's Landmark status on the National Register of Historic places comes from its time as one of the major transportation centers in the Southwestern United States. Originally designed by Jarvis Hunt, the 2nd-floor "waiting room" is now transformed to be an incredible 26,000 square foot space with 48-foot ceilings to host the grandest wedding receptions in the city. In addition to ceremony and receptions, it is a popular location for holding rehearsal dinners. Union Station is located in the Reunion District at 400 South Houston Street Dallas, TX 75202. 1/250; f/4.5; ISO 2000; 24.0 mm.